The Japanese say that the Shooting Star Candlestick charting pattern shows trouble overhead. Although it is a reversal signal, being that it is a single candlestick, it is not classified as a major reversal signal. As seen in the drawing below, the shooting star has a small real body (can be black or white) at the lower end of its range with a long upper shadow. It looks like a shooting star with its long tail blazing across the sky. 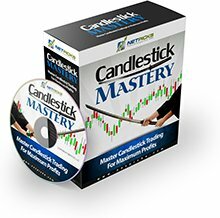 Since this candlestick formation is a bearish reversal signal, it must come after a rally. The size of it's upper shadow should be at least twice the length of the body, and the real body gaps away from the previous real body. The market gaps open above the previous day’s close in an uptrend. It rallies to a new high then loses strength and closes near its low: a bearish change of momentum. Confirmation of the trend reversal would by an opening below the body of the Shooting Star on the next trading day. If the open and the close are identical, the indicator is considered a Gravestone Doji. The Gravestone Doji has a higher reliability associated with it than a Shooting Star. Return from "Shooting Star Candlestick" to the Home Page: "Stock Market For Beginners"